﻿ Best Price on Village Pierre & Vacances - Sainte Anne in Saint Francois + Reviews! 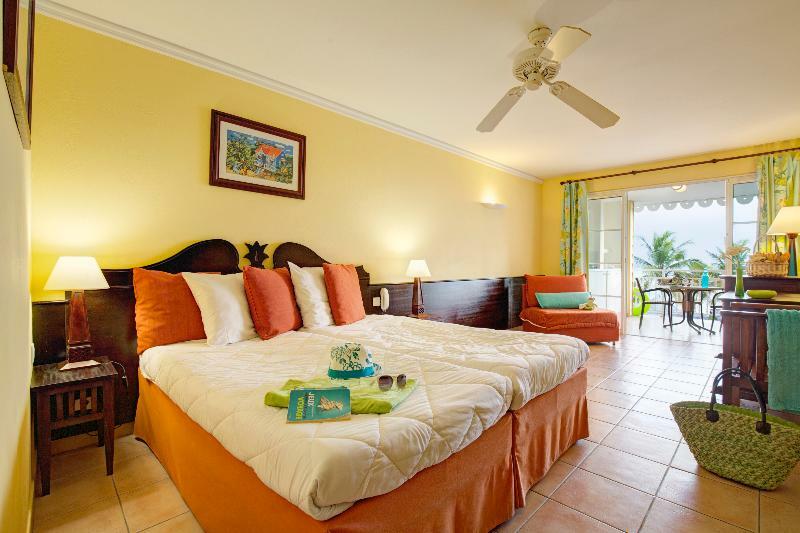 Located on the beachfront in Sainte Anne, Village Pierre & Vacances - Sainte Anne is a tropical apartment complex with a spa, swimming pools, tennis courts and lush gardens. Each air-conditioned apartment includes a balcony. Studios and apartments at Village Pierre & Vacances - Sainte Anne feature a fully equipped kitchen area with a fridge, microwave and dishwasher. A safe and a phone are available at an additional cost. The resort's spa includes a gym, massage area and relaxation room. Guests of all ages can also enjoy free sports and activities. A children's club is available for an extra fee during school holidays and includes a choice of activities a snack with each session. The complex also has a bar, restaurant and a reception. Village Pierre & Vacances - Sainte Anne offers wonderful views of the Caribbean Sea and the islands of Marie-Galante and Les Saintes. The beaches of La Caravelle and Bois Jolan are nearby, while Pointe-à-Pitre is 12 mi away. The price includes bed linen, bathroom linen and household linen (bathmat and dish towel). The beds are made upon arrival. Also included in the price is a cleaning kit and the end-of-stay cleaning (except for the dishes and the kitchen corner). The property offers a free basic WiFi connection that can be used on 5 different devices for navigating the web, checking e-mails and research and higher speed internet is available at an extra charge. Charges and taxes (excluding the tourism tax and application fee) are included in the price. A pool area and a playing/sports field is available and basic animation such as fitness, contests and parties are organized. For stays of 7 nights and longer, cleaning mid-week is provided (except for dishes and the kitchen corner) and bathroom linen is changed. For stays of 10 nights and longer, additional cleaning is provided (except for dishes and the kitchen corner) and bed linen and bathroom towels are changed every 7 days. A baby kit, suitable for children under 2 years weighing less than 15 kg, is available in the apartment at an extra cost, subject to availability. The kit includes: 1 folding cot with a mattress, 1 high chair and 1 changing mat. Guests are required to reserve a kit in advance. For any invoice requests, please note that the name used will be the name stated on the reservation. Children between 4 and 11 years old can enjoy breakfast at a reduced rate and children under 4 can enjoy it free of charge. In case the total amount of the reservation is not paid in the time frame set in the policies, the property reserves the right to cancel the reservation and apply cancelation fees. Please note that any modification may incur a fee. Please note that credit card is the only payment method accepted in the property. A damage deposit of EUR 500 is required on arrival. You should be reimbursed on check-out.